The Earl of March is a lovely 18th century county pub restaurant in the village of Lavant with splendid views of Goodwood and the South Downs. Originally a coaching inn serving stagecoaches on the main Chichester to Midhurst road, this is where William Blake the poet and composer in 1803 was inspired to write the words to the famous hymn Jerusalem. In early two thousand it ceased trading, before re-opening in 2005 after undergoing a stylish refurbishment and in 2007 was subsequently taken over by Giles Thompson, the former Executive Head Chef of the Ritz Hotel London. The restaurant has a contemporary décor with a stripped wood floor, cream walls adorned with pictures, wood tables with fresh flowers, set against smart brown coloured chairs. Meals can also be taken in the bar area which features luxurious leather sofas and an open wood fire. Dishes are based around keenly sourced regional ingredients and as well as the a la carte menu, there is a daily changing specials board to reflect the very best of what is on offer locally. Typically you might begin with pan seared diver scallops, cauliflower puree, crispy pancetta and truffle oil or seasonal game terrine, pistachios and field mushrooms, fig chutney served with toasted soda bread. Flavoursome mains follow such as pheasant breast, Parma ham, parsnip puree, pearl onions, mushrooms and a red wine sauce. Traditional puddings close the show with a sticky toffee pudding, butterscotch sauce and vanilla ice cream or white chocolate and orange brioche and butter pudding with white chocolate ice cream. There is an excellent wine cellar with a good selection offered by the glass and a choice of local real ales. 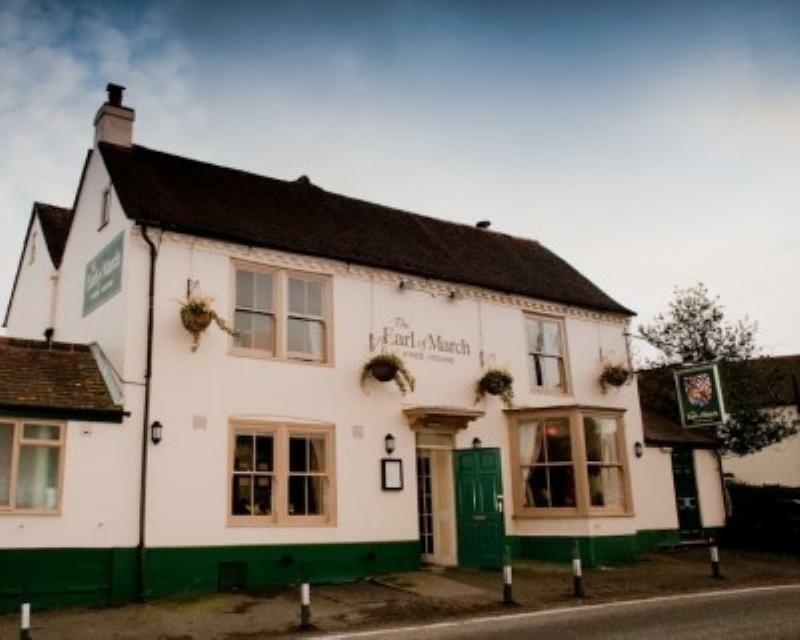 Service is efficient and friendly, and The Earl of March is a popular family destination, particularly for Sunday lunch. I was very impressed at how this restaurant catered for my family. I have two children 8 and 5 and they were made to feel very welcome even at 6.30pm. They also had some great gluten free options for my husband. Perfect mix of family friendly and relaxed but with a touch a class and incredible food. View of the downs just breathtaking! After reading the reviews I felt I just had to try the Earl of March. The location is fabulous and the restaurant charming; service is very good lovely polite attentive staff. Wish I could say the same for the food. The choice on the set lunchtime menu was poor; 1 fish, 1 chicken, 1 vegetarian. As I don't eat fish and did not want vegetarian I had no alternative than to order the chicken. My companion chose the haddock & chips. The chicken breast was served on mashed potato with a red wine sauce with 2 small carrots sliced in half. The sauce had soaked into the mash potato which left very little for the chicken. The meal was bland and boring! The haddock and chips looked fabulous, but the batter though crunchy on the outside, the inner had a thick layer of stodgy yellow batter; however the fish was fresh and the chips were ok. So disappointed as I was expecting a gourmet meal. I would return for a drink and maybe a sandwich during the summer months to enjoy the view but wont be having a meal here again.